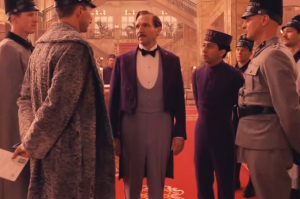 What do Quentin Tarantino and Wes Anderson have in common? Seemingly, nothing. On the surface, Tarantino’s blood-soaked frames, fed by the director’s ’70s pop-culture obsession and lurid revenge fantasies, have almost nothing to do with Anderson, whose childlike perspective can border on the twee, though the memories often seem to be offered up with a gin-soaked ironic distance. But in re-imagining parts of World War II, the disparate directors have created some of their best work – Tarantino with 2009’s Inglourious Basterds and Anderson with his new release, The Grand Budapest Hotel. Tarantino relied on an elaborate plot to ensnare Hitler and the Third Reich’s upper echelon, while Anderson approaches the era indirectly, setting his tale in the 30s in Zubrowka, a fictitious country on the verge of invasion. Budapest … has many of the elements of an Anderson film – it relies on childhood memories, lost first loves and characters who inhabit sets that evoke a paper dollhouse – but it’s anchored here by a delightful character, in an equally delightful turn by actor Ralph Fiennes. Turns out Fiennes, often so gloomy on film – he has grieved onscreen in movies like The English Patient and The Constant Gardener, and was appropriately chilling as Voldemort in, well, you know – has a remarkable sense of humor. He neatly captures the contradictions of his character, Gustave, the hotel’s upper-crust concierge, who lectures his youthful charge on propriety while bedding the aging clientele. These sorts of characters are rarely given a backbone on film, but here Fiennes is given free rein to be a teacher, a tough guy, a flirt, a fop, an object of ridicule and a rescuer. Anderson’s normal contributors, Bill Murray, Jason Schwartzman and Owen Wilson, appear but Fiennes sets the pace. Tony Revolori, as the concierge’s pupil, at times cannot keep up, and the film sags a bit in the middle as Gustave confronts a plot to incriminate him in the death of one of his amours, but more is at stake than one man’s freedom. Zubrowka is facing a bigger foe, and Anderson gracefully notes the loss of Gustave’s era, one we often look on as a time of gentility and grace before the world seemed to be plunged into one decade of war after another. Anderson always seems to be regretting lost innocence of some sort, but in rendering Budapest’s world so delicately, this time what he’s created actually seems to be a loss worth reflecting on and mourning.